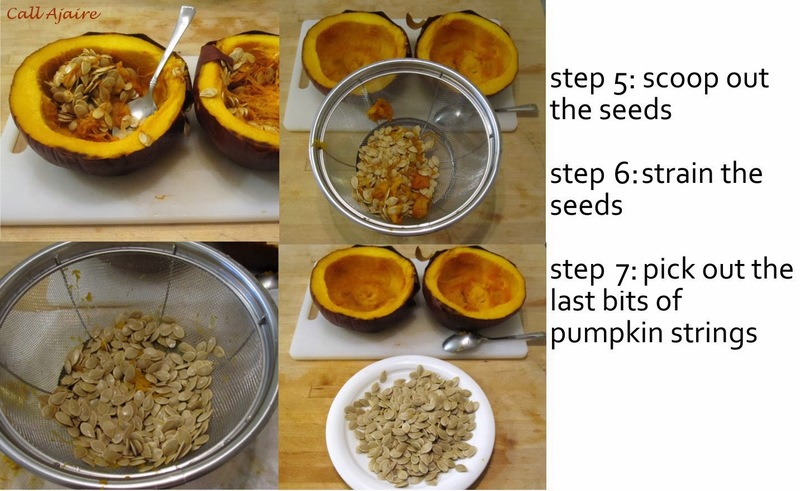 In honor of the holiday here in the US, I am posting my super easy cheater method for pumpkin puree. Seriously guys, this is the easiest thing in the world. 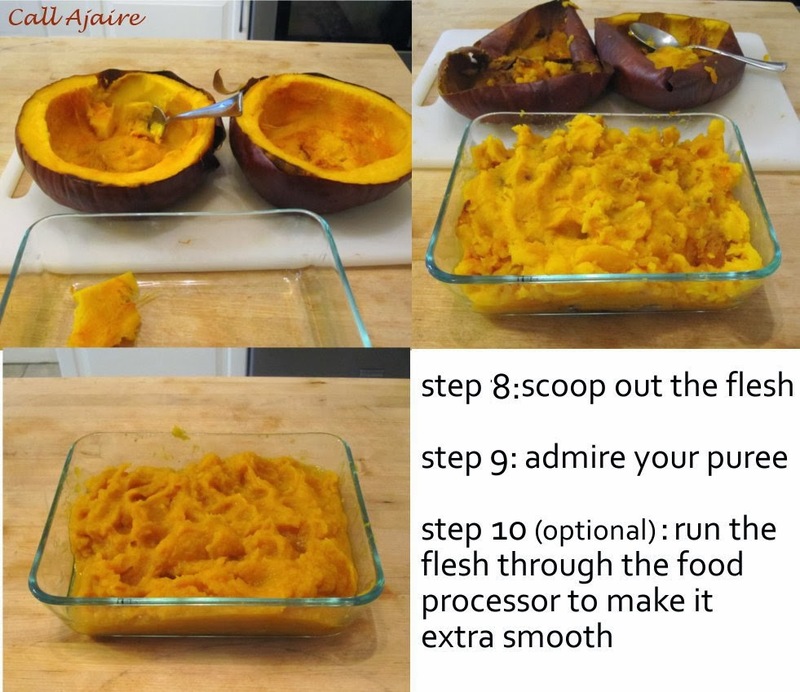 You basically just take a whole squash (in this case a pumpkin), roast it in the oven, and then scoop out the already soft flesh. 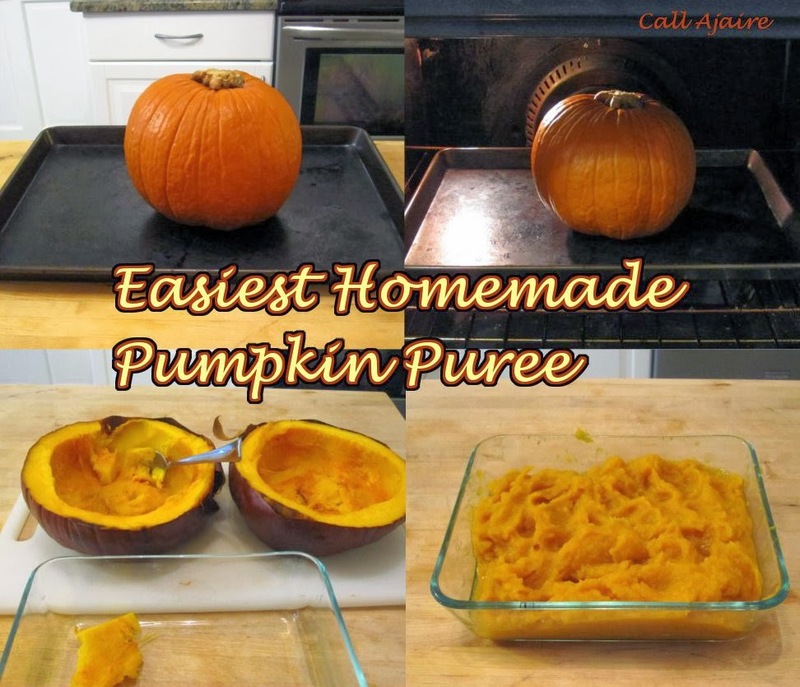 So much simpler than trying to cut open a hard skinned squash and deal with it raw. 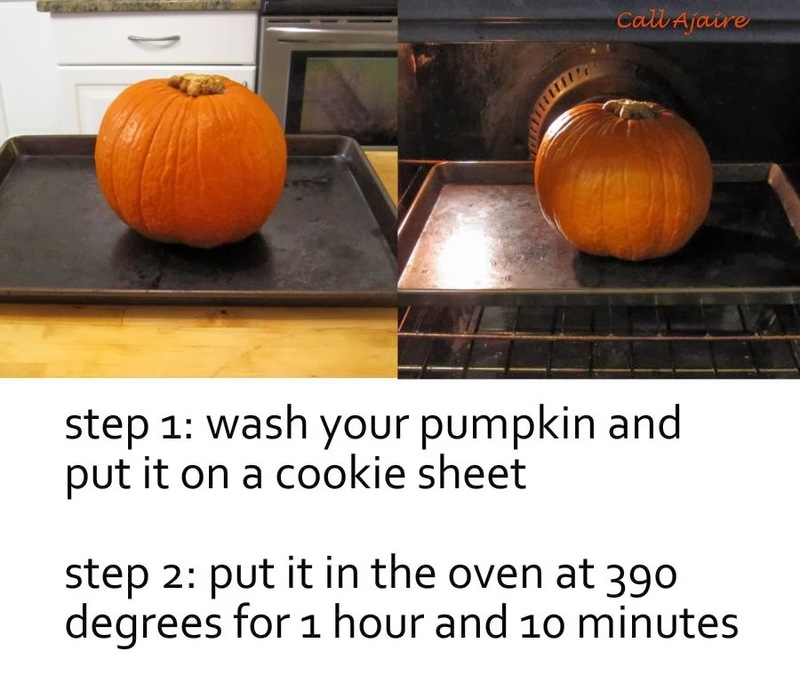 Step 1: wash your pumpkin (you don’t know where it’s been, hehe), dry it, and put it on a cookie sheet. Step 2: put it in an oven preheated to 390 degrees for about 1 hour and 10 minutes. You can try pricking the skin with a fork to make sure it will go through the flesh to make sure it’s done. Step 3: look at your shriveled pumpkin while you take it out of the oven and let it cool until it’s ok for you to handle. I usually leave it about 15 or 20 minutes so the flesh is still warm. 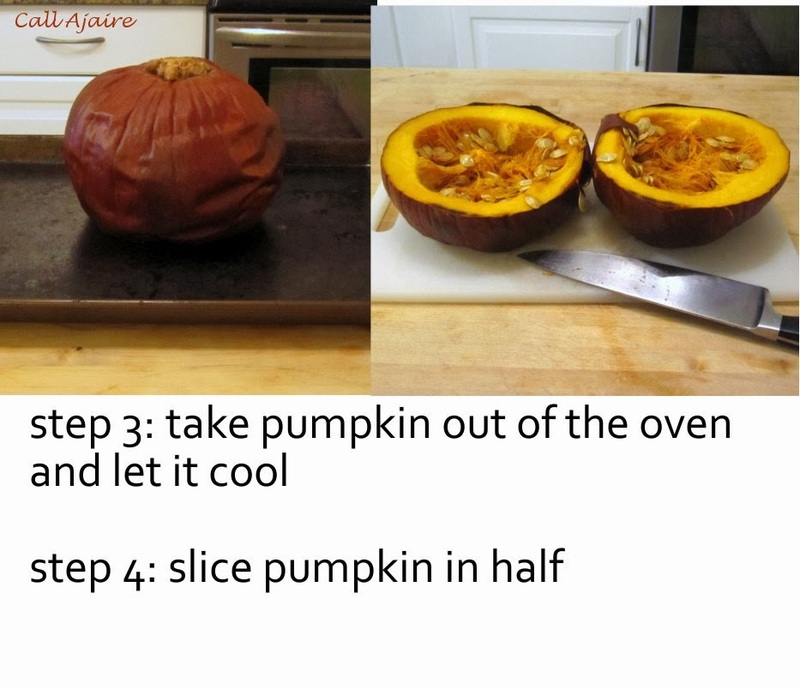 Step 4: slice the pumpkin in half. This is the easiest part since the knife cuts through like butter. Step 5: scoop out the seeds and bits of stringy flesh. Step 6: since the flesh is already cooked, the strings mostly melt away when you strain the seeds with water. Step 7: pick out the larger pieces of pumpkin strings left over. Now you have lovely pumpkin seeds without making a huge mess of raw pumpkin stringy goo all over the place. These seeds are now ready for roasting if you’d like. Step 8: scoop out the soft pumpkin flesh from the skin. Step 9: the pumpkin comes out super soft and is easily mashable in this state. Step 10: if you want it extra smooth you can run the puree through the food processor. This is how I make all my winter squashes. With Bean, we did baby-led weaning and I made all her “baby” food so for us winter squash and sweet potato were staples. Being able to just throw a whole squash or potato in the oven without fussing with a knife or peeling the skin made it so easy. But I have to say, now I’m most excited about how easily the seeds clean up. I really dislike all the pumpkin goo and having to run my fingers through to get out all the seeds is not my idea of fun. Since the goo has been roasted inside the pumpkin already, it is soft and practically dissolves in the strainer which is so helpful. I hope this little tip works for you too! Blank Slate Patterns (*affiliate link) is having a sale through the end of day on Friday. They don’t have sales very often, so you should consider taking advantage of this one. Use the coupon code BLACKFRIDAY to get two patterns for just $10! Go To Patterns (*affiliate link) is taking 25% off of Andrea Pannell’s patterns through December 2nd as well as a couple of other coupon codes you can check out here. I hope you all have a Happy Thanksgiving!! I did this but I haven't used the purée yet. I froze it in one cup amounts for later. Not sure when later will be…. I tried this a few years back- it was a disaster lol. I might stick to the can from now on- though you make it look easy!